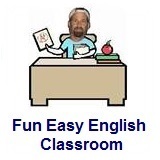 ﻿ Fun Easy English - new classroom free online classes english language lessons speaking listening writing reading january 8. 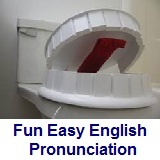 Today in the Fun Easy English classroom you will learn about American English pronunciation. Knowing a lot of vocabulary, and using perfect grammar MEANS NOTHING if nobody can understand you. Pronunciation is the most important part of your English language study. 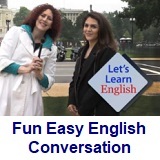 Today you will be introduced to the basics of American English pronunciation. American English pronunciation is all about using the proper mouth, lips, and tongue positions in order to correctly produce the basic 44 sounds of the English language. Your vocal cords are also an important part of pronunciation producing both "voiced" and "unvoiced" sounds. With "voiced" sounds you CAN listen to and feel your vocal cords vibrating when pronouncing the sound. With "unvoiced" sounds you CANNOT listen to or feel your vocal cords vibrating when pronouncing the sound. In addition, many of the sounds in English can be spelled a few different ways making it more difficult to learn correct pronunciation. For example the sound "aw" as in the word raw, can be spelled with a, au, aw, o, and ou. Learning English pronunciation is definitely where you should focus much of your study time if you want to speak English correctly. After all, using perfect English grammar and knowing a lot of vocabulary MEANS NOTHING if nobody can understand you. Conversation Lesson 8 - Are You Busy?